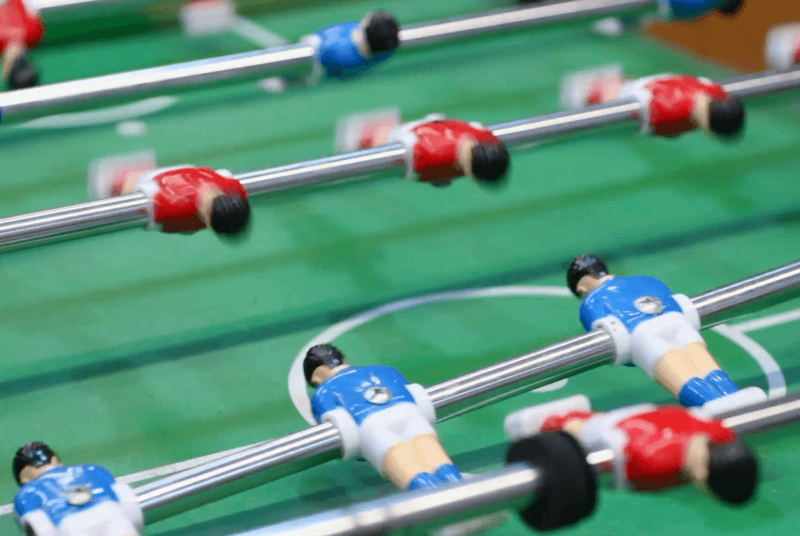 » Is Spinning Allowed In Foosball? When it comes to rules in any game, people tend to take them seriously, and ignorance of the rules is no excuse to break them. If you want to get serious when it comes to a game or a sport, the first thing you’re going to have to do is get acquainted with the rule set and thoroughly understand what you’ve gone over. Keep in mind that if you ask various people, you’re likely to get different answers to this questions, but we’re going to refer to the official rules of the sport. Beyond simply answering whether or not you can spin int rods in foosball, we’re also going to cover what exactly constitutes spinning and exceptional cases involving spinning. What Is Actually Considered Spinning In Foosball? The first thing we’re going to have to do is establish what spinning is in the first place, as this article won’t do much good if half of our readers don’t even know what we’re talking about. Spinning is the practice of spinning the foosball rods more than 360 degrees before you take a shot. 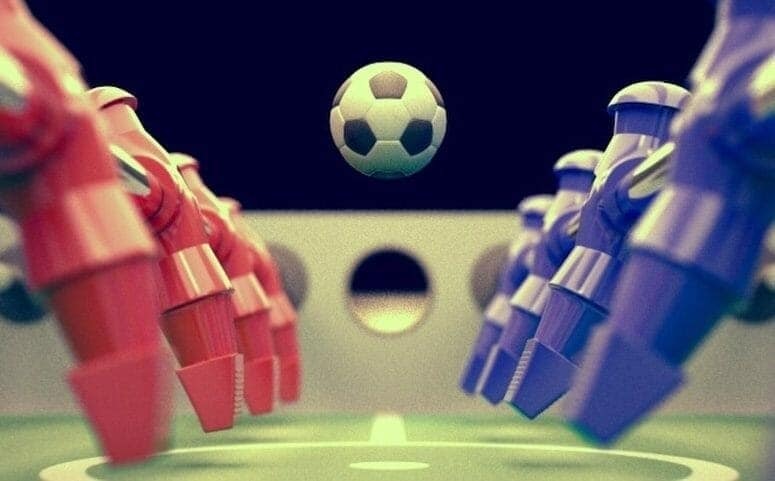 Foosball spinning is typically used by players who are inexperienced in foosball or simply lack the timing to make shots and block the opponent’s ones. For example, children who are just getting started playing foosball will typically spin their rods because they simply haven’t developed their reflexes enough. Spinning the rods shouldn't be confused with a similar term: putting some spin on the ball when you shoot. Putting spin on the ball is encouraged, and it consists of hitting the ball at an angle so that its rotational energy changes its course throughout the shot. In other words, putting spin on the ball is how you curve your strikes. While you will likely be praised for putting spin on your shots, you won’t get the same reaction when you spin your rods. 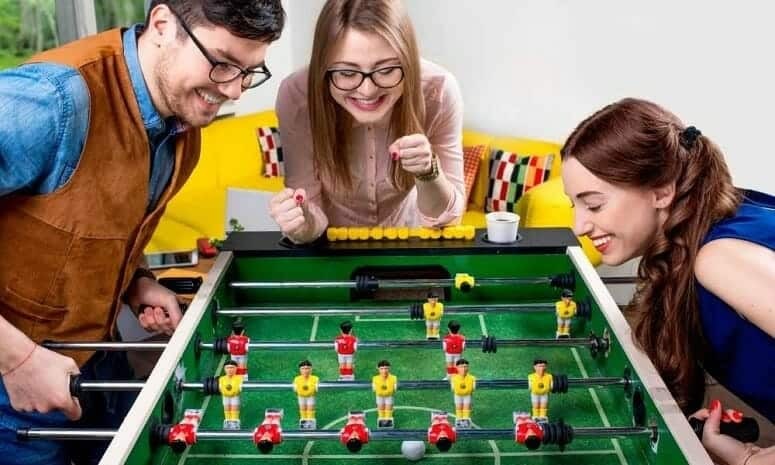 Of course, there is a wide range of different scenarios in which you can play foosball, so spinning the rods may not always be an inherently bad thing. The most crucial thing to know when it comes to spinning your rods is what the official rulebook has to say on the matter. In the rules of the game, a spin is defined as any movement of a row of foosmen that makes them rotate 360 degrees along their axis, which is essentially a no-tolerance policy towards spins. Of course, whether or not you’re punished or penalized for spinning your rods will be up to the environment in which you’re playing. For example, if you’re playing in a tournament and you get caught spinning your rods, you may end up ejected from the game or even from the whole tournament. On the other hand, there can also be a little bit more leniency if you get caught spinning, and this is typically in beginner matches. You may receive repeated warnings for spinning your rods before eventually being penalized, though this is usually not the case in more competitive environments. You may also find some foosball rule sets that will make exceptions for a certain number of spins, but this is not the case with the official rules used in tournaments. Let’s take a look at some of the times when spinning your rods may be tolerated. When Can You Spin The Rods In Foosball? Now that we’ve covered all of the ways in which you can’t spin your rods, you may be wondering whether or not you can ever do it. As we’ve already mentioned, you’ll find that various players have different feelings about spinning the rods, and some may not even care if you do it. For example, in the case of a simple match between you and a friend, you can spin the rods to your heart’s content, as long as the other player sees no issue with it. However, if you’re practicing for tournament foosball, it helps to build good habits early on, so you may wish to avoid it regardless. We also mentioned that some modified rule sets allow for a certain number of spins before it is considered illegal. Most tournaments don't use these rules because of how difficult it is to determine how many times a rod has spun in the first place, but it is a possibility in slower-paced friendly matches. If you’re trying to teach someone young how to play the game for the first time, it may be counterintuitive to prevent them from spinning the rods. Once a child has established a basis for their foosball skills, you can then move on to more advanced matters like spinning the rods. Does Spinning Give You An Advantage? One of the most common misconceptions is that spinning the rods will give you an advantage in foosball, but it’s more likely to result in the opposite. While it may be true that the momentum of the spin will result in a hard shot, it won’t be noticeably different from a well-executed wrist shot. In fact, spinning is random and uncontrolled, which is one of the main reasons it is against the official rules of the game. The nature of this movement means that throughout half of the spin, your foosmen won't be in a position to even touch the ball, potentially resulting in an uncontested goal. Spinning the rods in foosball will typically lead to more trouble than it’s worth, and it won’t help you build the skills needed to become a better foosball player. 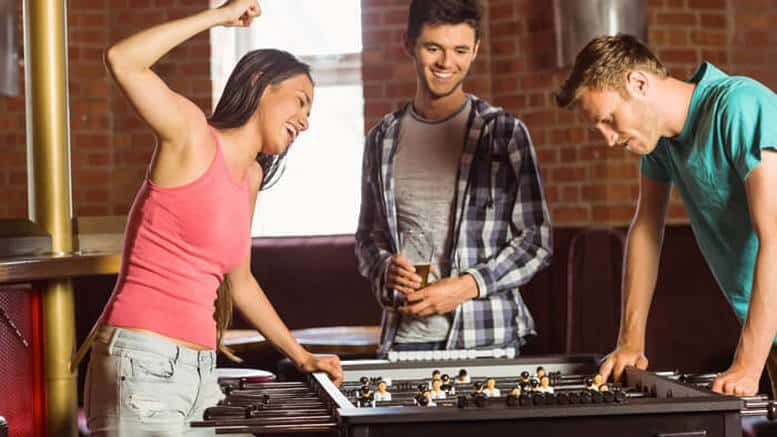 We hope that this guide has provided you with all of the relevant info about spinning in foosball. Feel free to drop us a comment down below to let us know what you think.